People love videos. We watch them when we’re happy, when we need motivation, or when we’ve got a question. We love them so much, Cisco predicts that by 2020, video will make up 82% of all consumer traffic. Marketers, being mostly human, love videos too. The right video is a powerful way to promote a product, build brand awareness, start a conversation, or launch a cool new feature. With so many options, figuring out where to start can be hard. It’s easy to get overwhelmed. 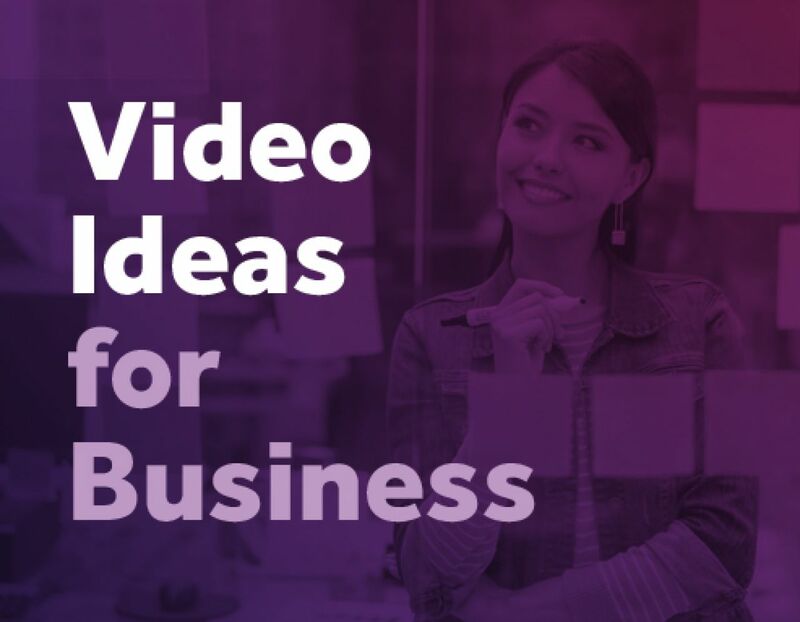 That’s why we’ve put together a list of ten business video ideas to get the creative juices flowing. What does your product do? What does your company stand for? Why is feature X great for small business owners? Your customers have a lot of questions you need to answer before they hit that Buy Now button. They want to get to know you and your product before committing to either. An explainer video is a quick way to share a bit more about what you do, and explain how your product solves a specific problem. This explainer video from Crazy Egg gives us a clear overview of what their product does. They hit all the bases, addressing the key customer pain points, and offering a practical look at how the product works. The best explainer videos are simple, concise and to the point. Don’t throw in that kitchen sink — pick one question and stick to it. Otherwise, you’ll lose your viewers. A great promo video grabs your attention and doesn’t let go. Ads and trailers are typical examples of the genre. They tap into your emotions and tease what’s coming next. Dodge has done this really well for the Demon, their new SRT. They released a series of short teasers that come together and support the brand story around the product. Your story is key. Make a video that’s a part of the great marketing machine propelling your brand forward. Your story is the fuel and your promo video should spark curiosity, attract the viewer and start a conversation. Facts matter, but reading figures on a page isn’t always the best way to present them. Instead of creating a flat infographic like everyone else, why not try your hand at something new? An infographic video is a great way to share data in an interactive way. By adding a voiceover and some music, you can transform an existing infographic into a video. This is a great way to repurpose old content. You can even make an infographic video about infographics, like the one above. And if you need some more inspiration, we put together a list of great infographic examples. Cartoon videos aren’t just for kids. You can use them to tell your business story, share a product update or show the data from your latest customer survey. It’s a light, engaging way to dive into a topic. Animation can even make storage fun. You can make a cartoon-style explainer video like Dropbox, using animation to tell your product’s story. It’s a great way to add some levity to your content. Before you hit the publish button, go through our Cartoon Video Checklist to make sure it’s good to go. Your audience wants to feel connected to the real you. That’s part of the reason YouTube vlogs gained so much momentum, and why live video is taking over your social media feed. There’s something raw and appealing about the behind-the-scenes version of yourself and your team. It puts your viewer in the room with you. An insight into your thought process and the way you run your business can be priceless. YouTube content creator Philip DeFranco does this really well. The main channel hosts the DeFranco Media content but the team shares exclusive behind the scenes vlogs a couple of times a week on a separate channel. This keeps the audience invested in all the people that make the channel happen. Your business is about more than your high-level executives. It’s about everyone that keeps the wheels turning. Share that part of yourselves with your audience and you’ll take your connection to the next level. Reviews are an important part of how your customers make decisions. According to a 2016 survey by BrightLocal, 84% of customers trust online reviews as much as they do personal recommendations. Instead of just listing them on your website, why not transform reviews into a video? You can create thematic videos, and group reviews that focus on similar features or solutions together. Consulting.com is a great example of a company that takes advantage of user-generated video reviews to prove it’s validity and trustworthiness. They have consolidated more than 3000 positive customer reviews into one page, and this huge number of customer reviews from typical customers has a great impact on their conversions. You can even use video to address critical reviews. If customers keep bringing up a specific feature or issues in their online reviews, you can create a video highlighting how you solved that problem. This shows you’re open to feedback and your willingness to act gives the positive reviews extra clout. Another approach is that you could create a space for user generated video reviews. Unboxings and reviews are a big part of YouTube content. A lot of them, like this Everlane review, aren’t sponsored by the brand. You can create a space on your website and incentivize users to share their reviews, giving visitors an unbiased source of information. There’s something about lists that makes them irresistible. Everything about lists is psychologically built to entice us. Use this to attract viewers. If you sell high-quality chocolate, you can make a top 10 video about the weirdest uses of chocolate in the world. Don’t be too set on the number 10 though, making a video around a top 5 or a top 3 can be equally effective if you handle it right. This video from Wishpond shares 8 landing page best practices. Don’t sweat the numbers, just pick a topic that’ll really spark some interest with your ideal customer base, and make a list video. Who doesn’t love a good tutorial? It makes that learning curve feel a lot less steep. We’ve made a few tutorial videos to help our users make the most out of Biteable, and they’ve worked well for us. How-to videos are relatively easy to make, and are easy to follow. They’re a great way to demystify a product or to teach the viewer something new. You can create tutorial videos that answer specific customer questions. If you make a productivity tool, you can create short tutorials around chief productivity questions. Contests are a fun way to generate hype and awareness around a product or brand while making it all seem like a game. Making a contest video is simple. Clearly share the rules of the contest, and walk viewers through the details of how to enter while getting them excited about it at the same time. The stakes don’t have to be as high as creating Elton John’s new music video, but you need to make the reward desirable. Use the video as a chance to get viewers excited, and show them exactly what they’ll gain by entering the contest. Testimonials are a powerful force. They give you the power of social proof. Video testimonials feel more trustworthy because you’re watching the story unfold in front of your eyes. Ask a customer for an interview and film it. Get the customer’s permission and create an animated video around their testimonial. Use Biteable to create a short video. The most important thing is to stay authentic. With phony video testimonials flooding the web, time-strapped companies can be tempted to opt in for a quick fix. Don’t. Trust, once destroyed, can be extremely difficult to regain. Believe in your product, and create a few supporting testimonials that show just how much it can help the right client. Video formats don’t exist in a vacuum. A well-crafted explainer can be a promo video. An infographic can be an interesting take on a customer testimonial. Effective videos are built around a story. Whether you’re trying to entice a customer to enter a contest, or you want them to go through a short tutorial, your video will be a lot more effective if it has an underlying story. Ideally, all your videos should share a common theme. Making a video for your business is about more than putting a script together. It needs to tie into your brand and support your marketing goals. Every piece of content you make is another piece of your brand’s puzzle. Know how it fits in.